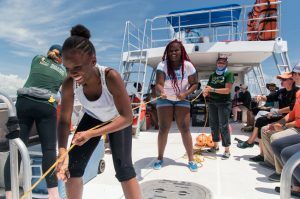 When was the last time your school field trip asked you to wrangle down a few half-ton sharks? 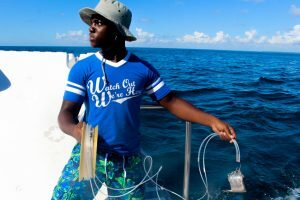 As wild as it sounds, that’s exactly what students in our Upward Bound Math & Science (UBMS) program did over a weekend this past summer. 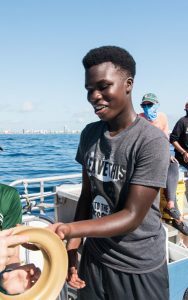 Frost Science’s UBMS program, funded by the U.S. Department of Education, recruits top-notch students from Title 1 schools in the Miami area and enrolls them in a four-year, after-school, weekend and summer program focused on science, technology and a culture of intellectual curiosity. 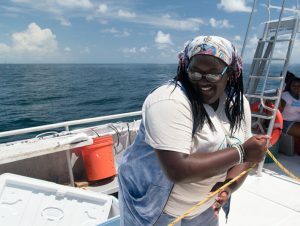 When educators boast of an immersive learning experience, they may cite a well-programmed field trip, the dissection of a unique specimen or perhaps an innovative classroom software. 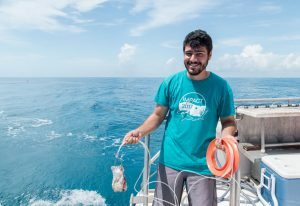 It’s not often that students contribute to the research of professional scientists in the field—much less capture half-ton sharks in the open ocean to collect data critical to conservation efforts. 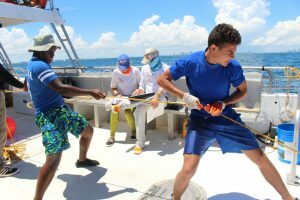 Serving as the culmination of a six-week marine science course, this expedition was made possible by the University of Miami’s Shark Research and Conservation Program (SRC). 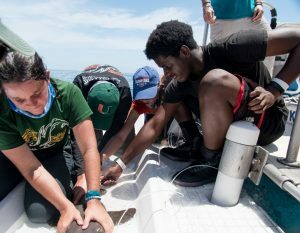 From August 11 to the 13, UBMS students caught and released 16 sharks along the coast of South Florida. 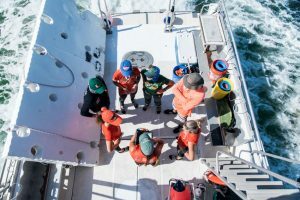 Amidst the exhilarating process of securing each shark onto a specialized platform, a series of tests and measurements were taken as quickly and carefully as possible. 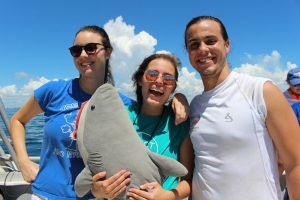 The students helped researchers set/recover bait, monitor the sharks’ stress levels, record various body lengths, insert dorsal fin tags and test several metrics that helped paint a picture of the water quality and other environmental conditions. And this was no simple eco-tour. From start to finish, the SRC team involved our students in the action. 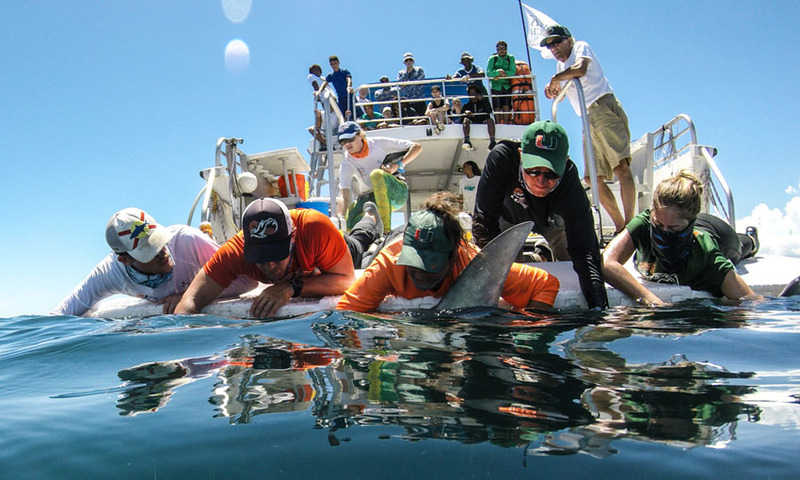 Their efforts gave researchers plenty of data that will be used to monitor the status of urban shark populations considering factors such as increasing water temperatures and overfishing. This data, once analyzed and synthesized, informs policy that can protect these ecologically indispensable predators. 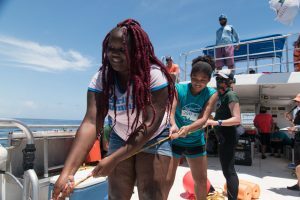 Students have been enjoying the shark tagging expedition with the SRC program for the past seven years—and it’s one that exemplifies the mission of UBMS at Frost Science. It exposes students to STEM career opportunities in an exciting and memorable way. 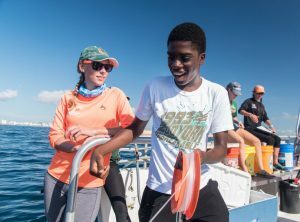 While a dry presentation about shark research may be educational, getting soaked alongside passionate conservationists transcends education—it’s inspiration.